Medschool.it learned this past week about three new state universities in Italy which are considering opening up English medical schools: Turin, Bologna, and Florence. Among the three, Turin and Bologna have publicly stated their intentions to start lessons in October 2017; we at medschool.it learned about Florence through other sources. The opening of these three schools marks the largest expansion of the English language med school programme in Italy since its inception. 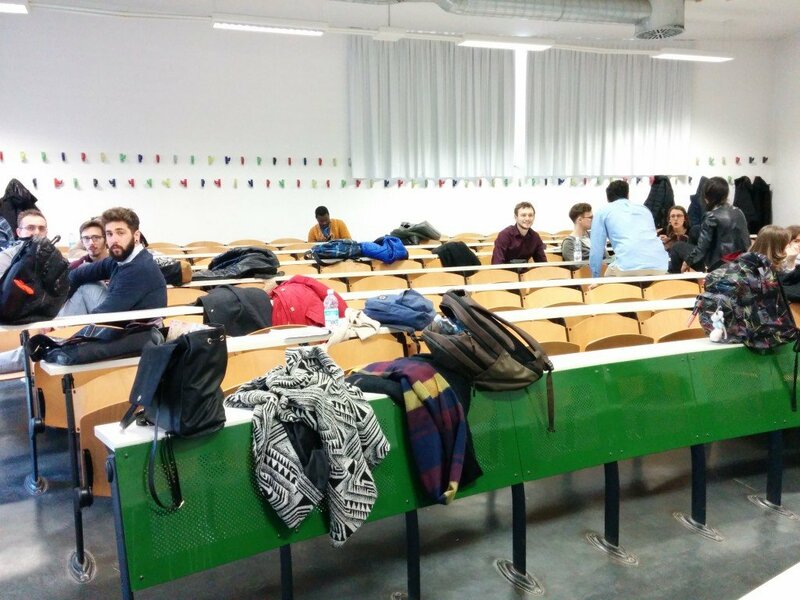 The current plan in Turin is to have 70 spots for EU and 30 for non-EU applicants, while Bologna expects 50 EU and 10 non-EU. This week, I visited Turin, and spoke to administrators and students, to learn more about what the university is offering. 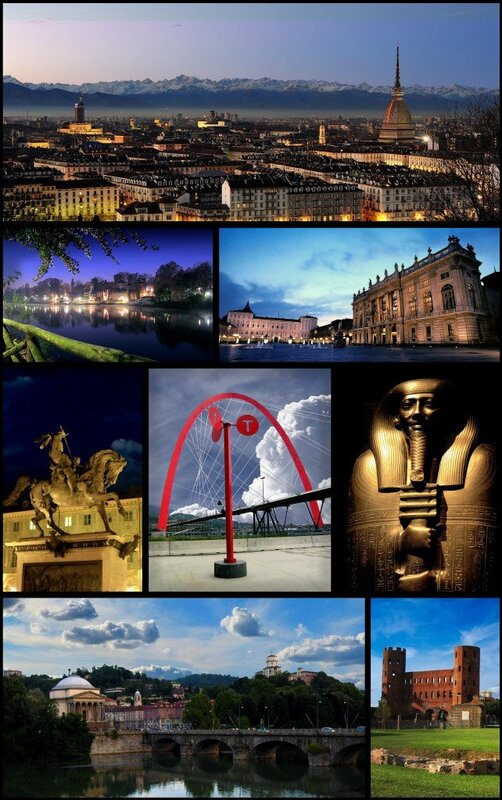 Turin’s cityscape is magical — almost literally, in that locals have superstitions about Turin being a centre of magic. This may make the city seem like a setting for a fantasy role-playing game as well as a medical school; I will explain further below. 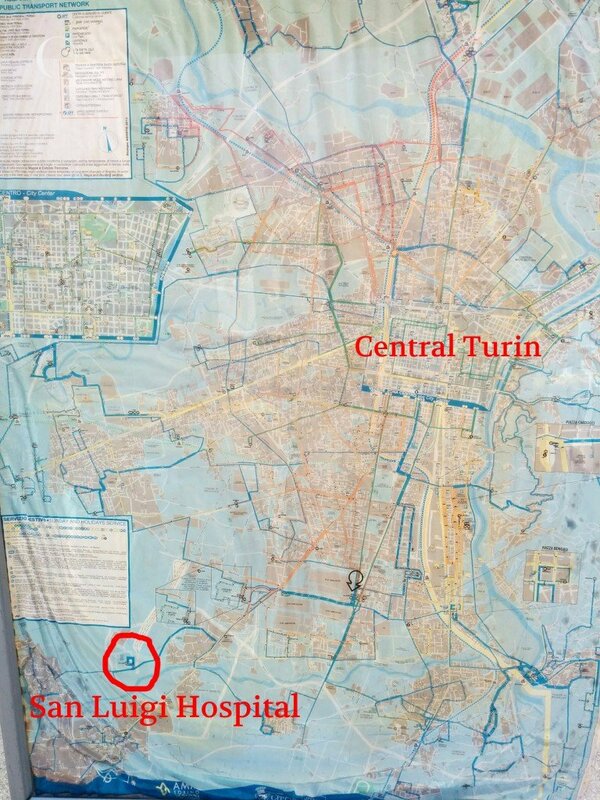 First of all: where exactly is Turin? Here is a map with all the current English-language med schools in Italy, Turin included. 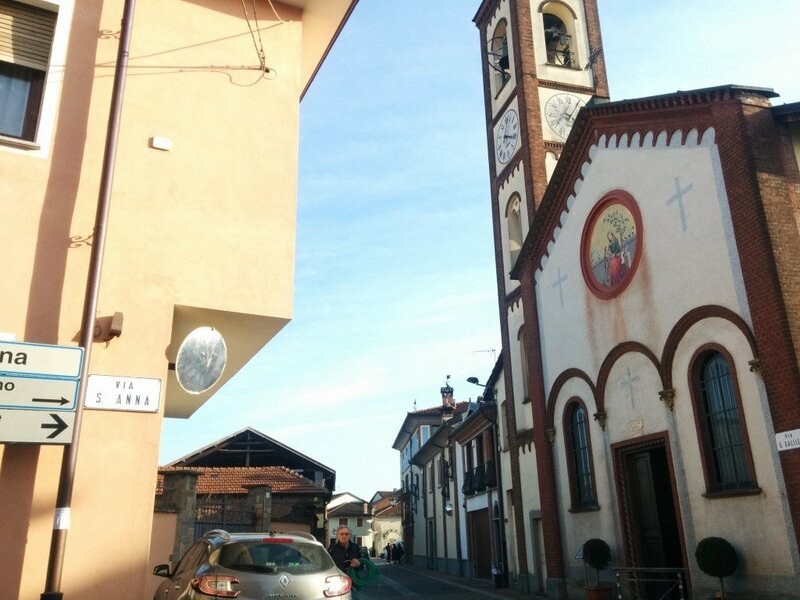 The city is in the northwest of the country, in the Piedmont region, right next to the Alps, which are often in view from the school. (“Piedmont” means “foot of the mountains”.) Turin is close to France, and has often historically been under French control. Many residents speak French and the cuisine and architecture are French-influenced. This personally warmed my heart, as France is my favourite country on Earth. 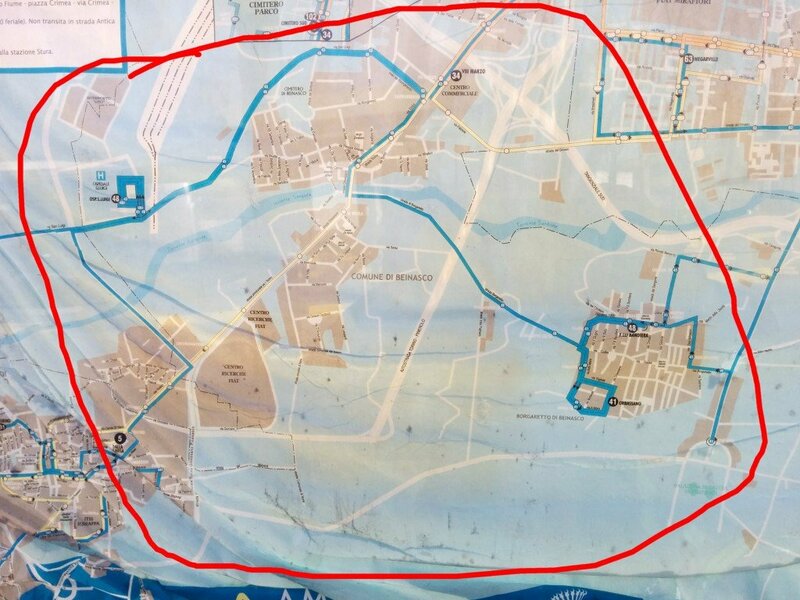 San Luigi is inside that blue square (which represents the bus lines which go around the hospital). 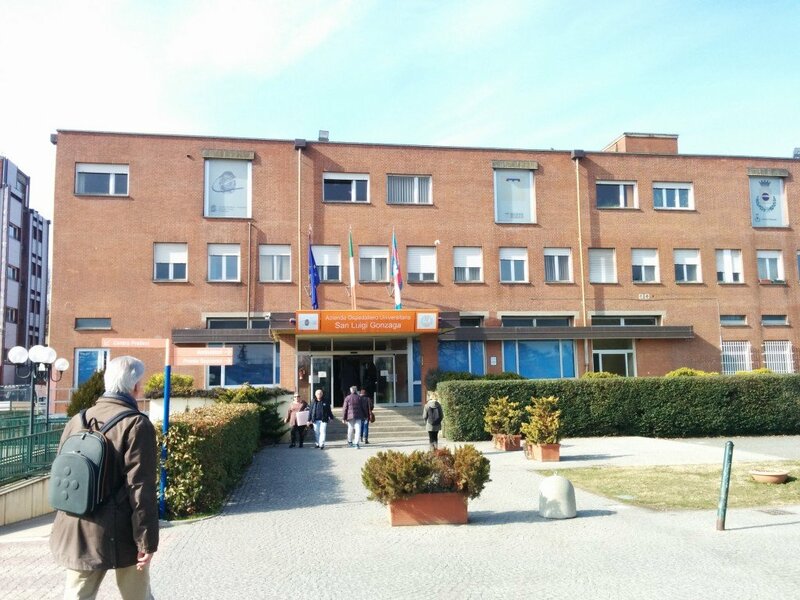 It is a small facility, relative to some of the other teaching hospitals of English language med schools in Italy, such as Umberto I Hospital at Rome-La Sapienza, or San Raffaele Hospital in Milan. 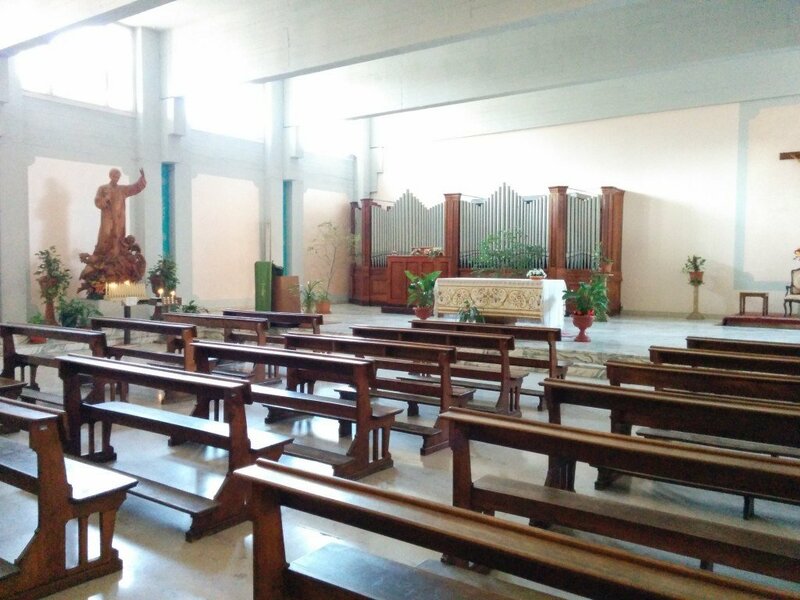 San Luigi’s intimacy is one of the strengths of the school, as we shall see. 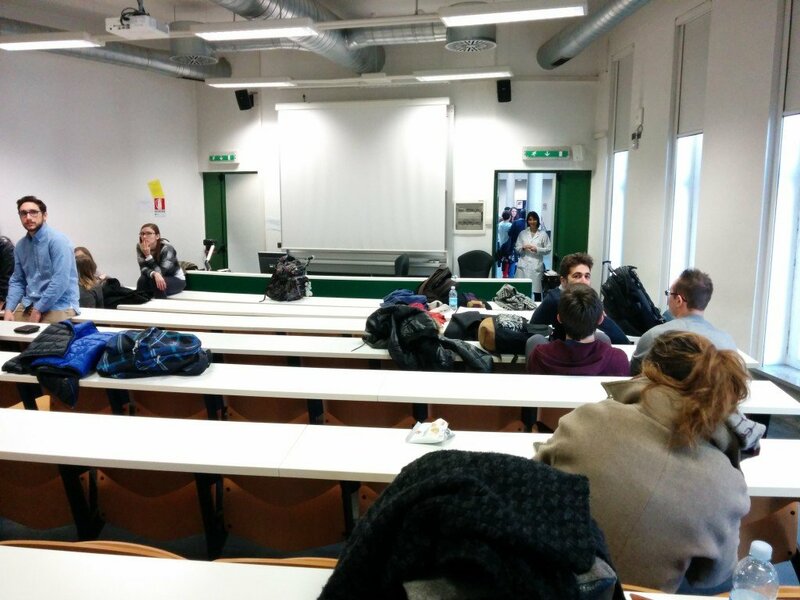 San Luigi does not have residential facilities on campus, unlike Pavia or Humanitas, other English language med schools located outside of big cities. This means that you would be living somewhere off-campus. Public transit to San Luigi is by bus only, even though, as you can see on the map, there is a rail line that goes right next to the hospital. It is currently only used for freight. 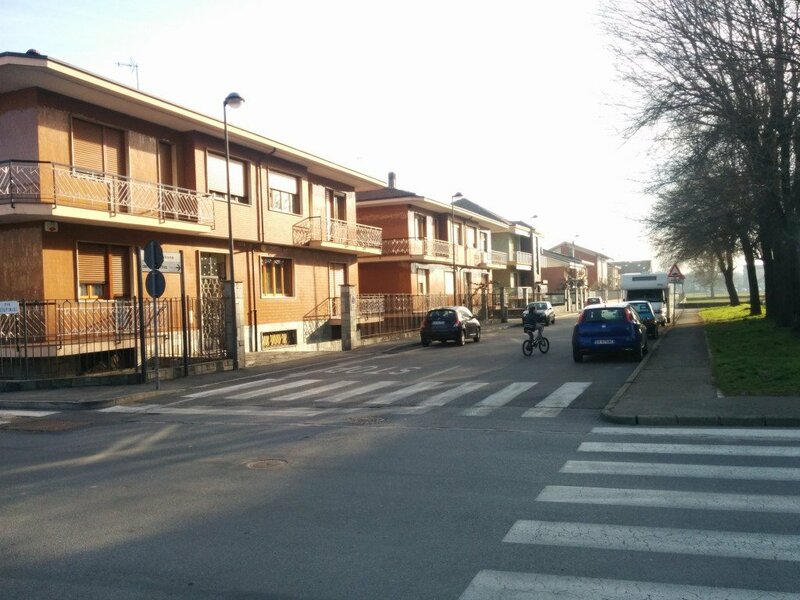 University of Turin administrators are floating the ideas both of building residential units at the hospital, and of getting the city transit authority to run passenger rail to the hospital from the city centre. 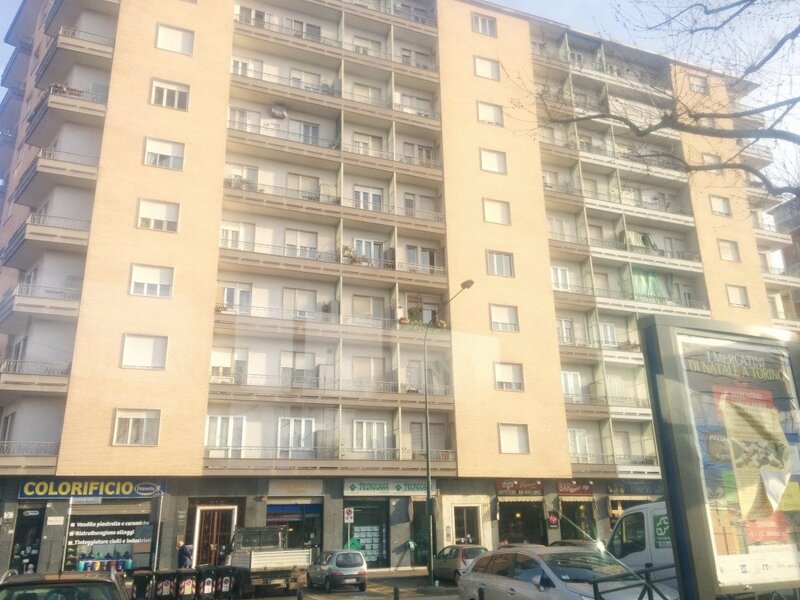 …or perhaps in a suburban high-rise like this. 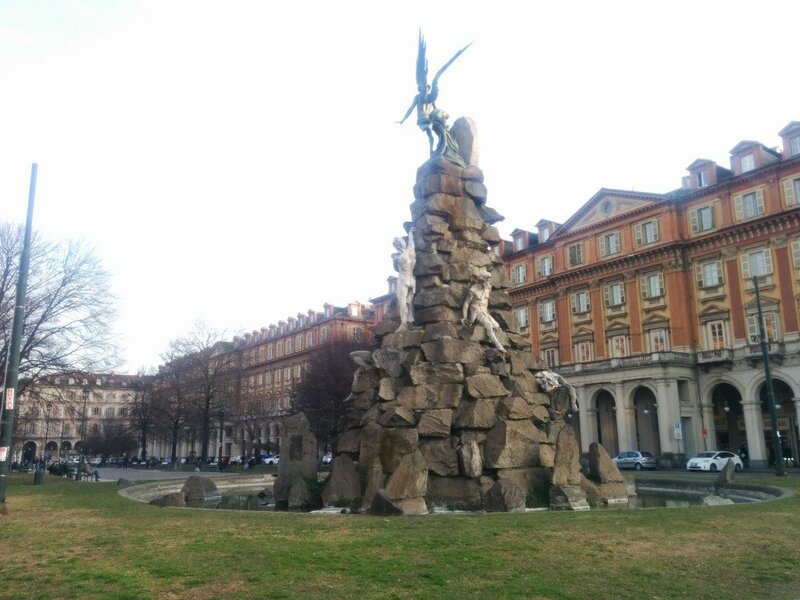 The Turin students told me, by the way, that San Luigi Hospital was placed outside the city limits, because originally it was a sanitorium for tuberculosis and other airborne infectious diseases. 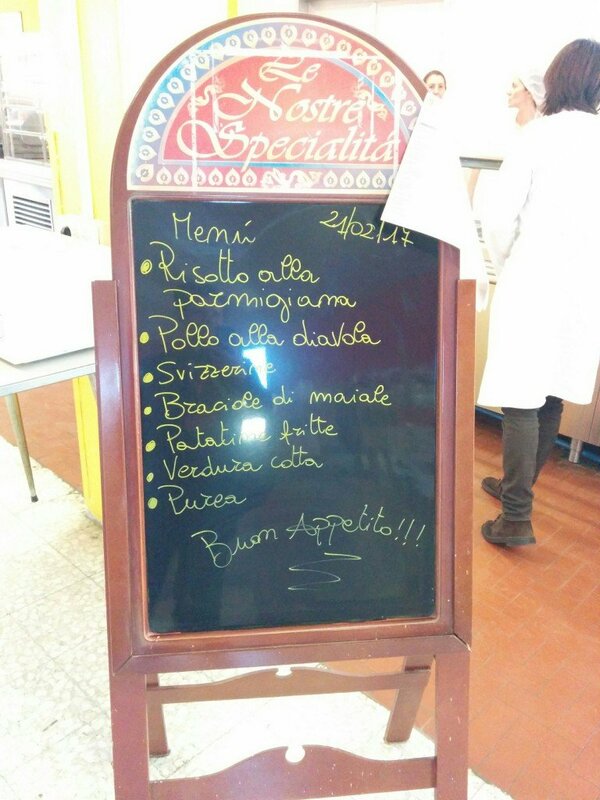 Cafeteria lunch menu. The students told me the food is “very good”. 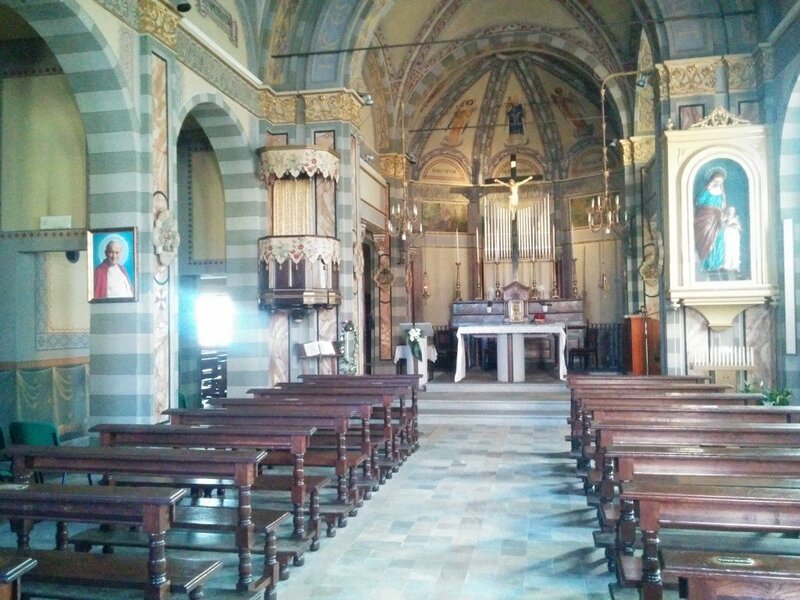 San Luigi’s “bar”. 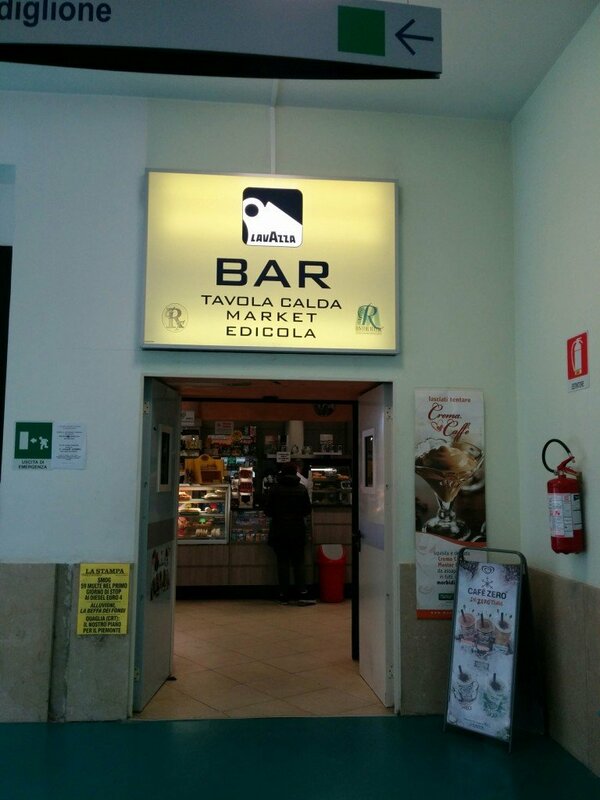 Note that in Italian, “bar” usually means coffee bar, not a place where you go to have alcoholic drinks. One of the first things that struck me about the med school at Turin was how kind everyone one was — students, deans, and professors. They gave me a warm welcome and talked all about the programme. Here are some highlights about the proposed Turin English med school that I gleaned from these conversations. Please note vigorously that I am not sure if all of this is exactly true; I am reporting back what I understood from various conversations. Clinical practice will start in the first year, with students shadowing nurses. 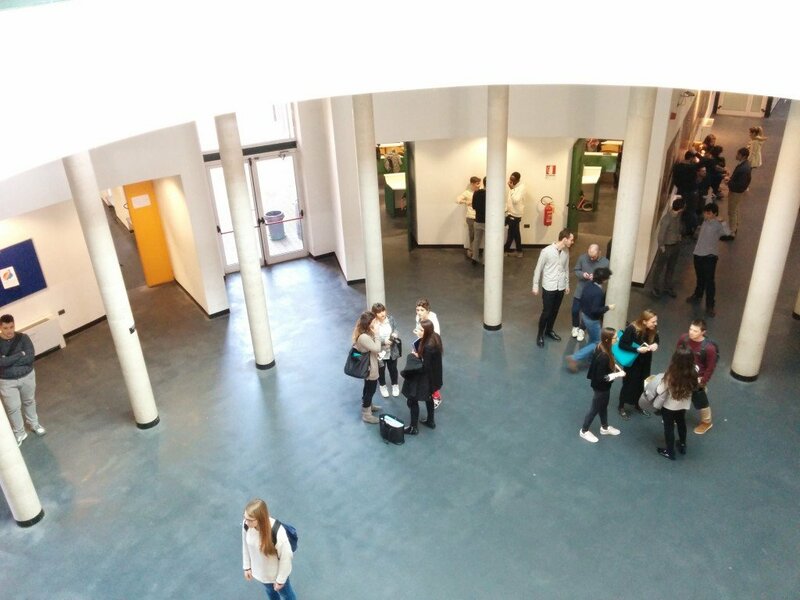 This is a major contrast to the other English-language state schools in Italy, where the first two years are normally only dedicated to theory. 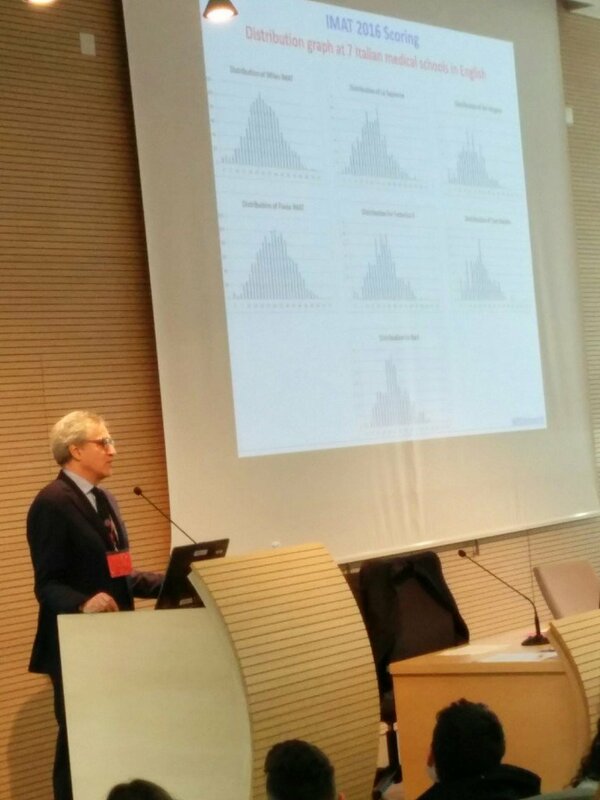 At IMS Milan, for example, there is virtually no patient interaction until the third year. The testing emphasis will be on written, rather than oral, examinations. This more closely mimics the Pavia style of testing, and less that of Milan. Attendance will be taken, and very seriously. Rather than sign-in sheets (on which students can fake signatures), there will be roll calls at the beginning of classes. An MD-PhD curriculum — or something similar — will be on offer. 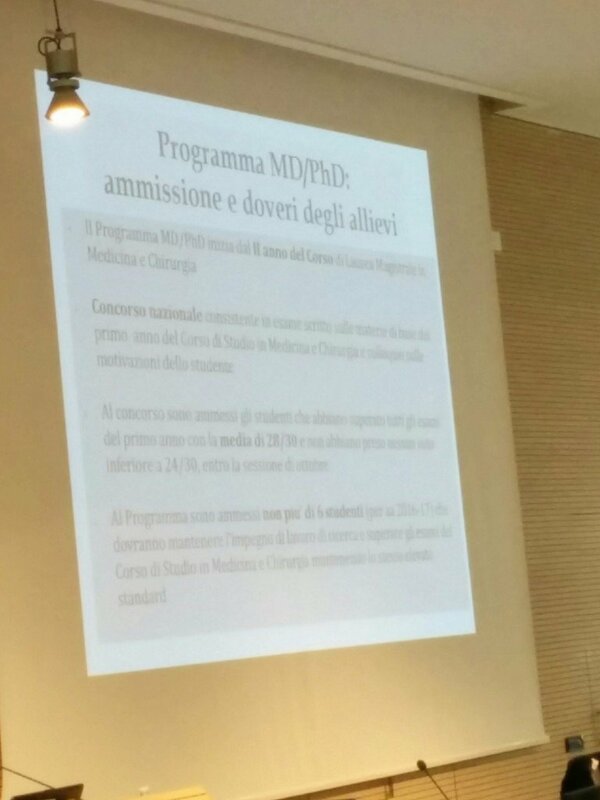 As far as I know, this would be the only English-language MD-PhD programme in Italy. The MD-PhD has some fabulous benefits — see below. 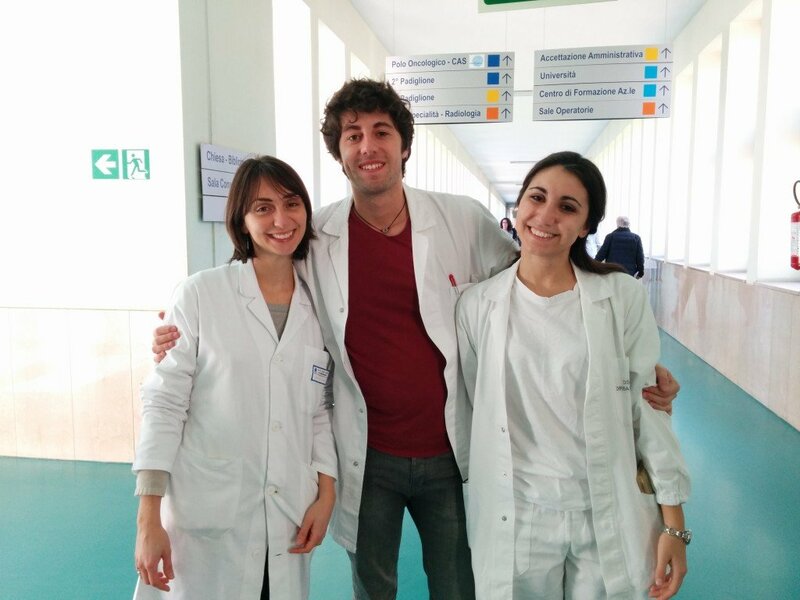 During my visit to Turin, the medical school held its open house, or what Italians call its “Open Day”. This took place at one of the University of Turin sites in the city centre, next to the incredible monument and symbol of Turin, the Mole Antonelliana. The dean gave a powerpoint presentation about the new English medical school. He discussed the MD-PhD programme. This slide explains that entering into the MD-PhD requires participating in a national competition. You must have, in your first year, an average mark of 28/30 and no marks below 24/30. 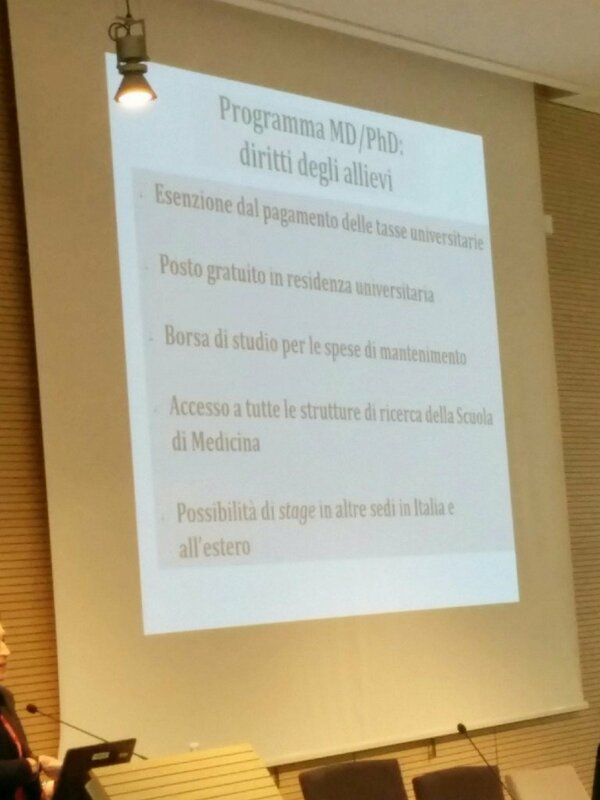 MD-PhD students do not need to pay university fees, get free housing in a dormitory (ostensibly in the city centre), as well as a scholarship and internship opportunities around Italy and the world. The dean flattered us here at medschool.it by citing some of our blog posts in his presentation. Here, he presents the IMAT distribution graphs from guest blogger Jeffrey Liu’s A Statistical Analysis of the 2016 IMAT Results. 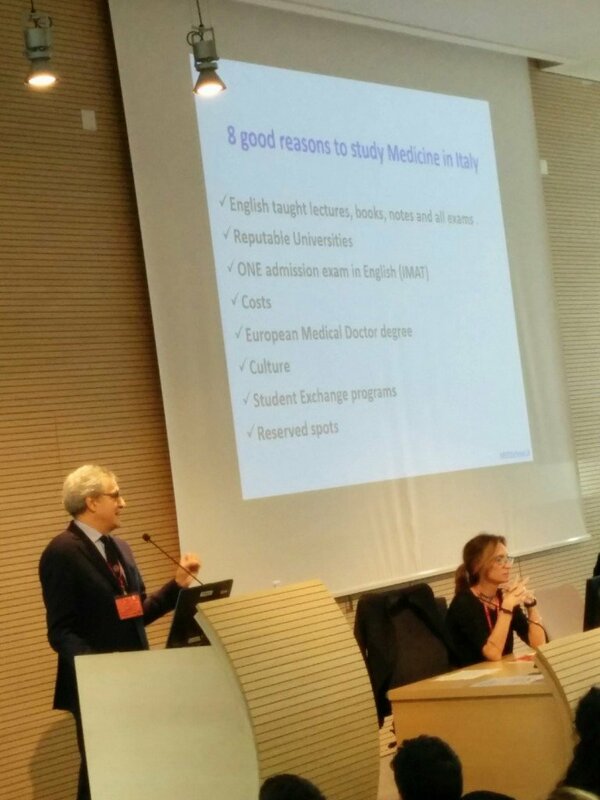 And here, the dean presents Alex’s famous 8 Good Reasons to Study Medicine in Italy, on our home page. I mentioned earlier that Turin is associated with magic. Residents claim that some cities belong to an axis of white magic, such as Lyons and Prague, and others of black magic, like London and San Francisco. Turin, supposedly, is where these axes cross. Indeed, there is a strange sort of spiritual quality to the city’s buildings, with lots of five-pointed stars and spooky faces looking down at you from facades. Turin houses one of the holiest (and most controversial) relics of the Catholic Church, the shroud of Turin, whose container you can see inside the city cathedral. I happened by the following monument, found it interesting, and took a picture. Only then did I learn from a guidebook that this place, the Piazza Statuto, is said to contain the portal to Hell. The Gates of Hell are said to be around here. The origins of the belief in the occult in Turin are actually from the mid-19th century, when the city’s ruling family, the house of Savoy, decided to make it a safe haven for people under religious persecution. Hence, Protestants, Jewish people, Mormons, and others arrived in Turin, and all sorts of rumours started to swirl about the supernatural consequences of such varied spiritual practice in one place. The one real blight in Turin is the same that you find all over Italy, and much now of western Europe: graffiti tagging, where people quickly spray paint their nicknames all over buildings, including very precious, artistic, and ancient structures. Italy’s tagging is completely out of control; I even saw it in an outdoor corridor right next to the cathedral. The fantastic movie director David Lynch says that graffiti is ruining the world and making the planet ugly. 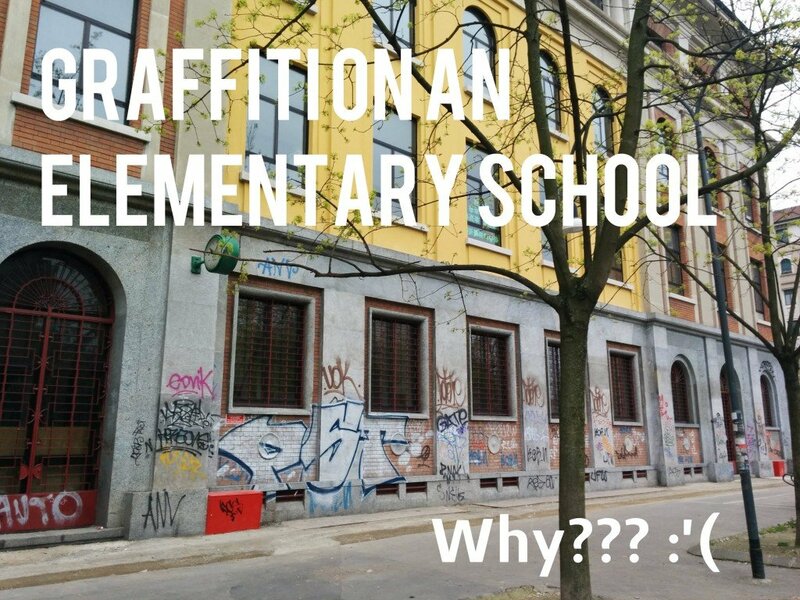 Anyway, the presence of graffiti should not really make a difference in your choice of which Italian med school to apply to, because there is no city which is not covered in it. This is not Turin. 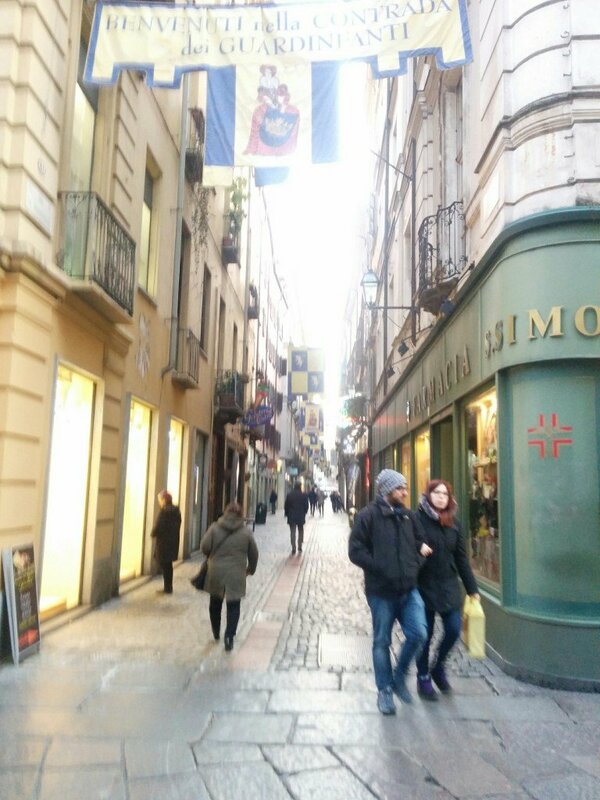 It’s Milan, near my home. I joined a community team which cleaned all that graffiti off. 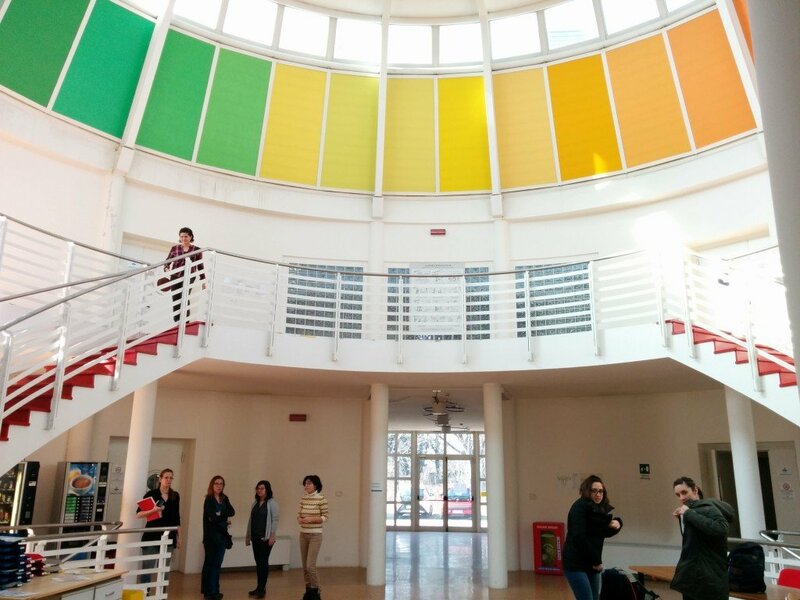 What is the impact that the new Turin English med school will have on the IMAT, and on other English med programmes in Italy? Turin may end up joining Pavia, Milan, and Rome La Sapienza as one of the competitors for the most desired schools in the country. That is because the university is relatively highly ranked — its medical school was in the 76-100 range in the Academic Ranking of World Universities, 2016. 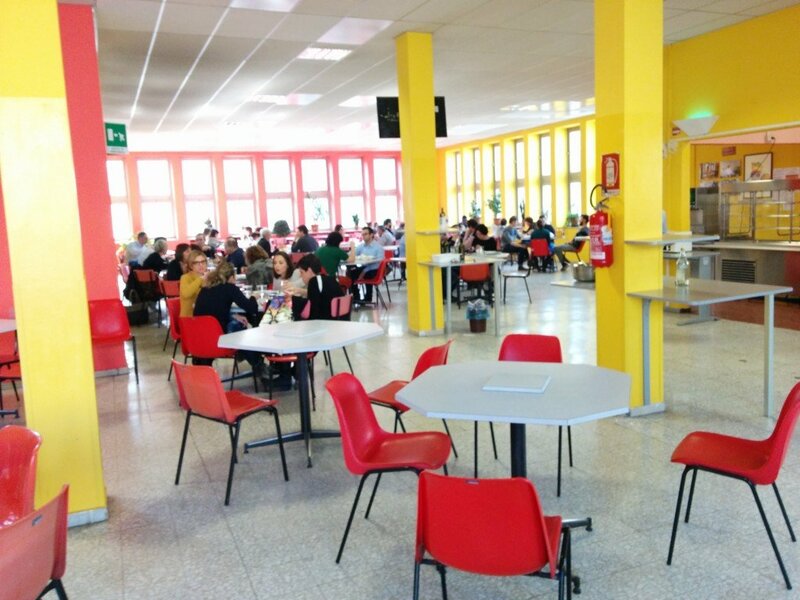 Since the teaching and hospital facilities are not in a chaotic city centre, but rather on a safe, enclosed campus, Turin should appeal to parents particularly of younger overseas applicants. 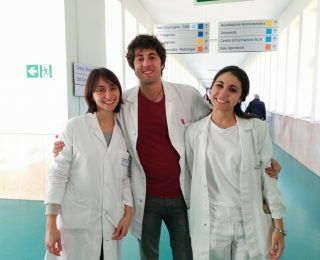 If Turin truly does begin with clinical work in the first year of instruction, this may end up being a big drawing point, particularly for applicants from English-speaking countries, where the clinical portion of medical education is given priority and usually starts right away at the beginning of the curriculum. However, we still do not have much information about the proposed programmes in Bologna and Florence. Both of these universities may end up also being highly competitive — Bologna because of the fame of its university, and Florence for its world-famous beauty. It remains to be seen what the addition of Turin, Bologna, and potentially Florence will have on what choices people make in their school rankings on their IMAT application.